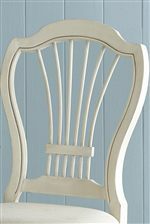 Pastoral elegance will flood into your dining room with the addition of these handsome stylish side chairs. Flared back legs and turned front legs make it easy to fall in love with the cottage chic design. 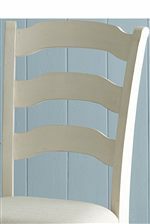 The stylish wheat back is encased in a beautiful harp back that adds a stunning touch to this chair. The plush seat makes it easy to relax and enjoy a meal with your family in comfort. 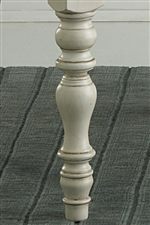 Choose your finish from either Dark Pine or Old White to find the look that is perfect for your home. The Pine Island Dining Side Chair with Harp Back by Hillsdale at Conlin's Furniture in the Montana, North Dakota, South Dakota, Minnesota, and Wyoming area. Product availability may vary. Contact us for the most current availability on this product. Let the handsome cottage style permeate your home with the addition of this beautiful Pine Island collection to your home. Charming, pastoral aspects abound around every corner as you explore this collection. Beautiful turned legs, arched ladder back and wheat harp back chairs, trestle tables, and lovely storage pieces all create a one of a kind country chic collection that you will love in your home. Choose your finish from either Old White or Dark Pine to find the look that will add rustic charm and grace to your home for years to come. The Pine Island collection is a great option if you are looking for Cottage furniture in the Montana, North Dakota, South Dakota, Minnesota, and Wyoming area. Browse other items in the Pine Island collection from Conlin's Furniture in the Montana, North Dakota, South Dakota, Minnesota, and Wyoming area.